Takeaway: To ensure you have the right amount of protection, it's not enough add up the arc ratings of each layer of clothing. You will need to perform a multilayer test to make sure your workers are adequately protected. In this article, we’ll break this down and teach you how to put together the perfect FR work outfit for the chilly winter months. It’s certainly possible to create an FR outfit using just a winter coat and a non-melting base layer, but this is far from ideal for a few reasons. The main one is that FR outerwear can be heavy and bulky, creating mobility issues and discomfort for the worker. Layering helps manage these challenges and is a cost effective, functional way to ensure protection and comfort while on the job. Base layers are the first layers you put on but they're the last line of defense against flash fires and arc flash hazards. In addition to the hazard protection, the base layer offers an added degree of warmth to guard against the cold. For this reason, it’s important to select one made with a material that wicks away moisture and sweat. Base layers don’t have to be FR-rated, but it’s always best if you can purchase ones that are. Doing so allows you to use the layer to achieve the necessary HRC and ATPV ratings. One thing's for certain, though: base layers must be non-melting. Synthetic base layers can be extremely dangerous because synthetic materials can ignite and continue to burn, and might even melt onto the skin. Only use clothing made from 100% natural materials (no blends) like wool, cotton, or silk. The insulating layer is worn on top of the base layer and provides additional warmth and protection to the wearer. The thickness and rating of this layer will depend on specific work requirements and the climate, but common winter options include FR turtlenecks and FR sweatshirts. The weather protection layer is the final piece of a complete FR winter outfit. It consists of an outer layer that keeps the user protected from the elements. FR winter jackets are one of the best and most common options. In climates that aren't too frigid, however, a heavy FR sweatshirt or vest might be sufficient. To ensure the user's comfort, the outer layer of a winter FR outfit should be breathable while offering protection against wind, rain, and snow. While layering clothing to protect the body is critical, no winter outfit would be complete without accessories to protect other exposed body parts, including the hands, feet, face, and ears. Here are some important items that you’ll want to consider. Depending on the weather, you may opt for something that covers the entire face or just the ears and top of the head. 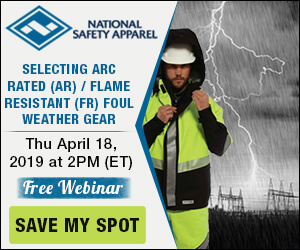 There is a variety of FR balaclavas, beanies, hoods, and other hats available to meet these needs (learn about 4 Problems with Traditional Arc Flash Head Protection). Hands frequently are frequently exposed to hazards, so it's important to make sure the gloves you select have the right FR properties. Be sure to also choose gloves that allow enough dexterity to perform work tasks with ease. Socks are an often overlooked – but important – part of a winter FR outfit. Wool is a great option here, since it’s naturally flame-resistant and offers plenty of warmth. The winter season brings its own challenges and hazards to the workplace, but by layering FR clothing properly, you can be sure that your workers are protected year 'round.